This week was so hectic! Our house is in disarray with our remodel, work has been crazy busy, Kylie had her first Homecoming this weekend, and a very dear friend of mine has her boy on life support. Needless to say, I find myself very tired and worn out this Sunday evening. Thankfully, I still managed to get all my workouts in. My workouts are truly my saving grace when times get tough. Monday: swim, albeit a short one. I made it to Arne Hanna and did about 1/2 hour. 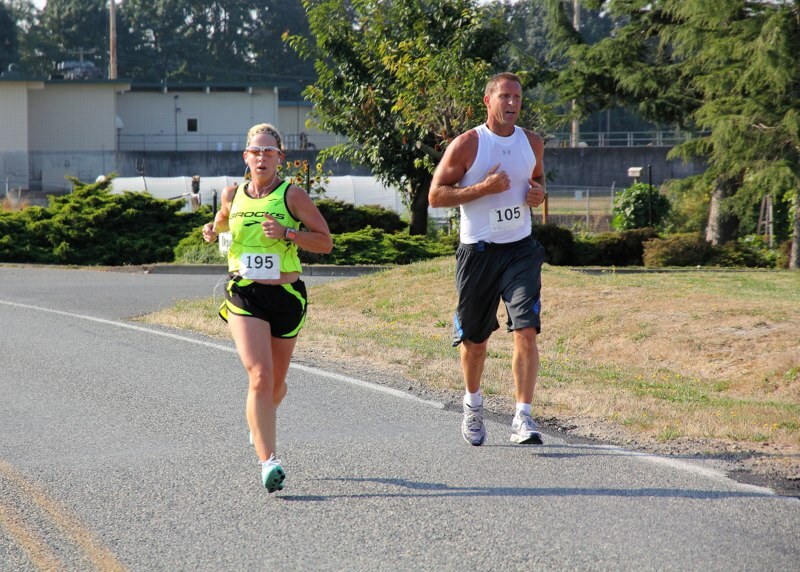 Tuesday: Track workout with GBRC (Greater Bellingham Running Club). 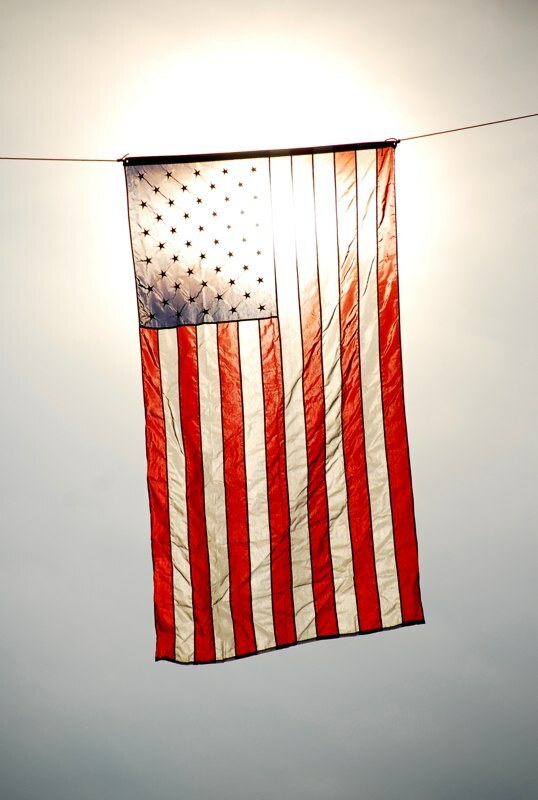 I ran about 1.5 miles warm-up, then 3 x 1 mile repeats at a 7:10 pace, 1 mile cool-down. Friday: 7 mile run at an 8:21 average pace. 6 miles at MP. Hopefully week 6 will be a little less hectic, but for some reason I’m already doubting that. Ha! Then I remembered to cut myself some slack as this week was a step up in mileage and intensity, AND my 14 mile run today was supposed to be between an 8:30 to a 9:30 pace. So I was on the slower end….big deal. 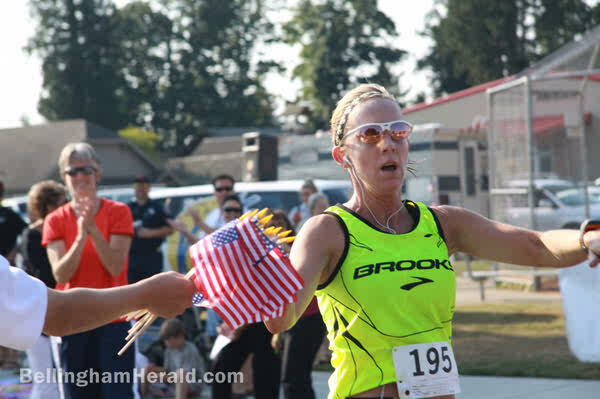 The really big deal for me was nailing my tempo pace on Tuesday and my marathon pace on Friday. Onto to week 5. I’m not one to give up! My fun factoid Friday, begins with Harry. Huh? Let me explain. Starting today, I decided to write something a little odd, a little fun, maybe a little dumb, about me! So, here is Harry. Harry didn’t help me learn my helping verbs, my eighth grade English teacher did. She challenged us to learn our helping verbs and beat her in reciting them in 10 seconds or less. Seeing as how I am always up for a challenge, I memorized and could recite my helping verbs in 8 seconds! To this day, I can still recite them on the spot! PHEW! Now tell me a fun factoid about you! 😉 Happy Friday! I wanted every possible advantage in riding my fastest for my upcoming triathlons, so this season, I invested in a tri bike. 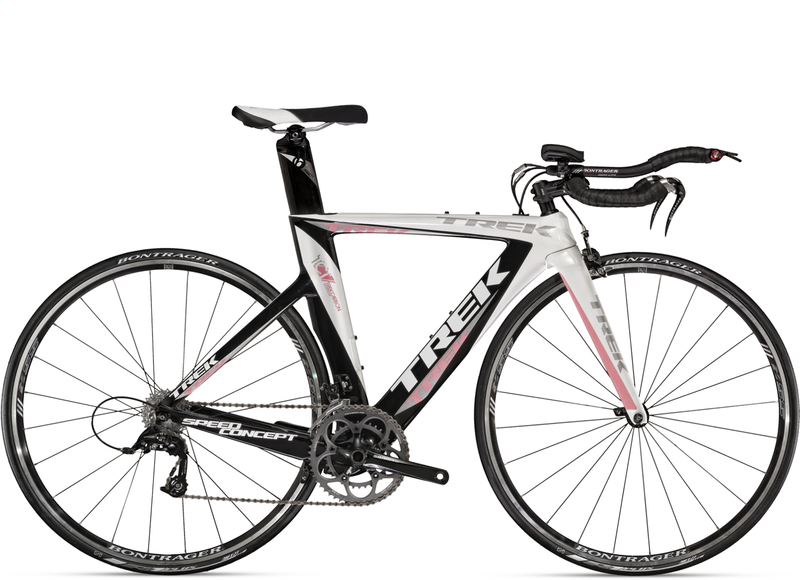 I looked at several, but when it came right down to it … I just wanted another TREK because my Trek Madone Road Bike has never failed me! Of course, I had to take it for a test ride. But, I knew I would love it! Even with the reflector’s and tester pedals. It rode like a dream! I bought Shimano clipless pedals and brought my dream bike home. It is too good to just sit in the garage. After a couple hundred miles, it was time for a new seat! Two reasons. One, the stock seat was very uncomfortable in the aero position and for long rides lasting more than 2+ hours, the girl parts were not so happy with me. Two, this saddle is one my coach recommended. I chose the ISM Adamo Road Saddle. I debated between the road and the race saddles, but after reading many reviews, I picked this one. I LOVE IT and couldn’t be happier! One last thing this great bike needs … RACE WHEELS!!! Zipp 404’s 650c clinchers. They are wicked FAST! I was thankful this week was a step-back week, as I was extremely busy at work and running the kiddos to all their activities. My body and legs seem to be adjusting to more running, but I think they secretly miss the swimming and biking of Ironman training (so do I). I was happy to include both in my workouts this week. Monday: Swim. 1200 yards in 100 yard intervals on 20 sec rest. It felt so good to be back in the pool (ps… I never thought I’d say that!). Tuesday: 3.36 miles. 1 warm-up, 1 mile at 7:28 pace, 1.36 miles cool down. Average 8:45 pace. Wednesday: 2.25 miles easy. Average 10:14 pace. SLOW! Friday: 3.54 miles. 1 warm-up, 1 mile at MP (8:00 pace, but ended up at 7.49 pace), 1.54 miles cool down. Average 8:43 pace. Saturday: Bike. 19 miles in 1:20. Very easy. 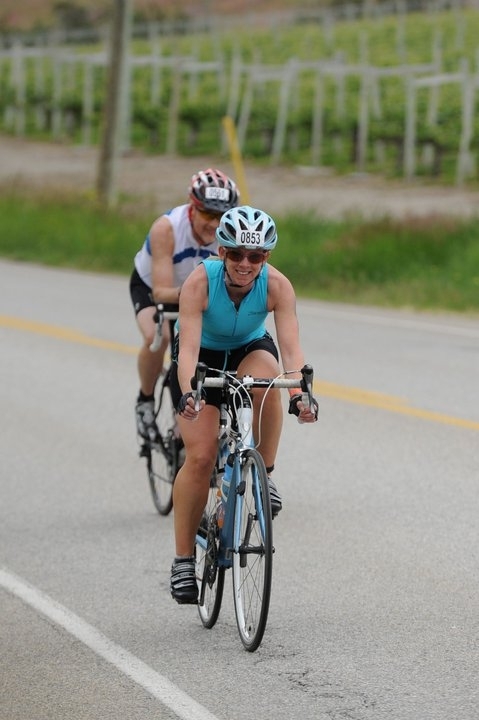 This was my first outing on my bike since Ironman Canada. Boy, did I miss it! Average speed 14.2. Sunday: 8 miles. Easy and relaxed, averaged an 8:58 pace. Total miles for week 3: 19 and some change running miles, 19 biking miles, and 1200 swimming yards. 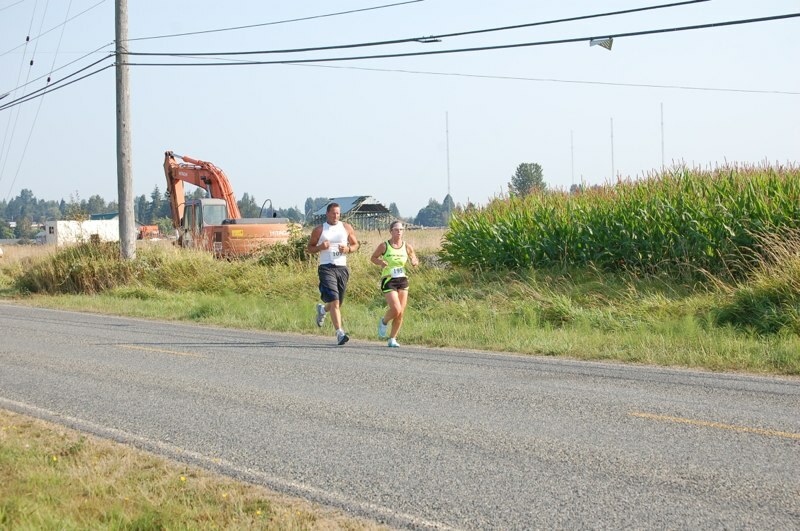 Coming off of Ironman Canada on August 28, 2011, I thought I might want to take a break from racing for a bit. That lasted, oh, about three days. 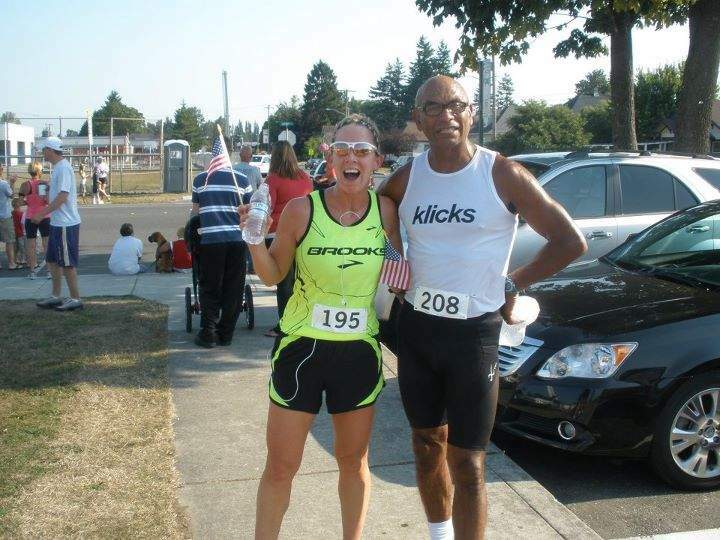 Then I get a text from my friend, Meghan, which read: “Sooo… interested in training to run a 3:30 marathon?” Uh, yes! I do! And with that, I started looking at December marathons. I thought I would go back to where it all started for me in 2006 … my very first marathon: California International Marathon. I texted my coach and asked if he thought I could be race ready in 12 weeks AND take 11 minutes off my PR. Daryl said it was doable. So with that, I signed up! Monday: Rest or Swim. I chose to swim in Lake Padden, albeit, a short swim. Tuesday: 5 miles. 2 warm-up miles, 2 miles at 7:20-7:40 pace, 1 mile cool down. Friday: 5 miles. 2 warm-up, 2 miles at MP (8:00 pace), 1 mile cool down. Saturday: Rest or bike. I chose to rest. I had a work conference in Portland, Oregon this week making workouts a little tough. Especially since my hotel was several miles and two freeway exchanges away from my co-worker in the Industrial area (not a runner friendly area). Monday: Rest or Swim. I chose to rest and pack for Portland. Tuesday: On the plan was 5 miles. 2 warm-up miles, 2.5 miles at 7:20-7:40 pace, .5 mile cool down. I didn’t arrive in Portland and get checked in to my hotel until after 5 pm, so I did 4.5 miles with 2 miles at tempo pace as I had to go and meet co-worker for dinner. Wednesday: 3 miles easy. I talked my co-worker into running after class today. 3 miles from his hotel on the waterfront in Portland. Very nice area! Thursday: 3 miles easy. I woke up early to run my 3 miles as the co-worker and I had a networking event after class today. I went to my hotel so-called “gym” which consisted of one treadmill and one weight rack. There was no ventilation, no windows, no air conditioning. Basically a sauna for 3 miles. Miserable! Friday: 5 miles. 1 warm-up, 3 miles at MP (8:00 pace), 1 mile cool down. I considered getting up early for another treadmill session, but that thought lasted only one nano-second before I remembered how miserable it was yesterday. I considered driving to the waterfront and running by myself, but someone decided to drive their vehicle into the river and drown so the boardwalk was closed to any sort of foot traffic. Then I thought I might get this run in after getting home late tonight. That didn’t happen as my family was ready for game night. I decided to miss this 5 miler and not worry about it. Saturday: Rest or bike. I chose to rest. Actually was a busy busy day, starting with football, then a housewarming for some friends, then dinner with other friends. Felt like I was going on day long. My inner voice won and I decided to give it a whirl. I drove down to Pioneer Park and registered all three of us for the 5K. 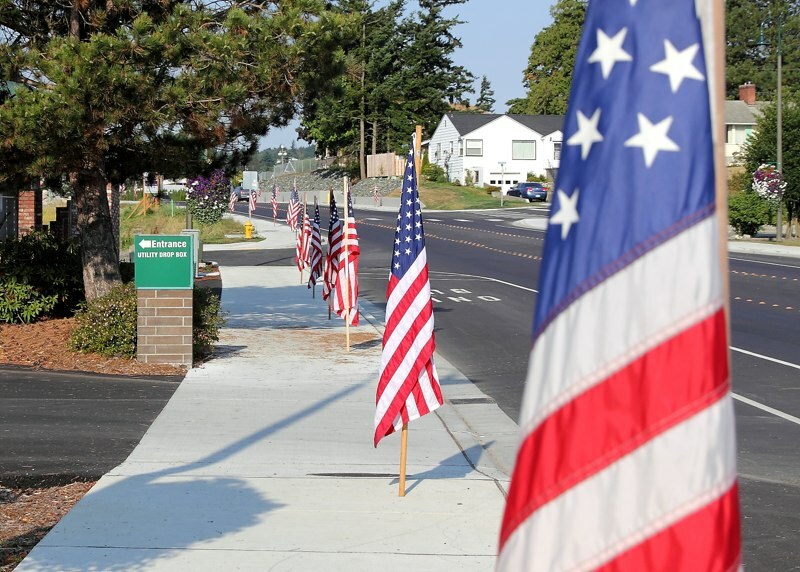 Whatcom County Fire District 7 firefighters put the race together and were busy trying to get the fire engines in place with the American Flag flying high. It was sunny and warm already and I wasn’t particularly nervous, I just wanted to “see” how I would do. More and more people started to arrive. 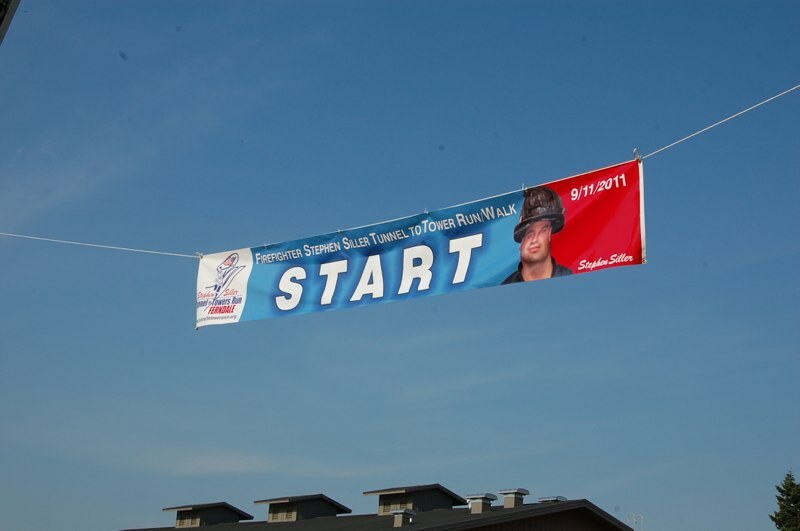 By the time the race was underway, a little over 200 were registered and ready to race. No chip timing, just a clock on one of the engines was displayed. 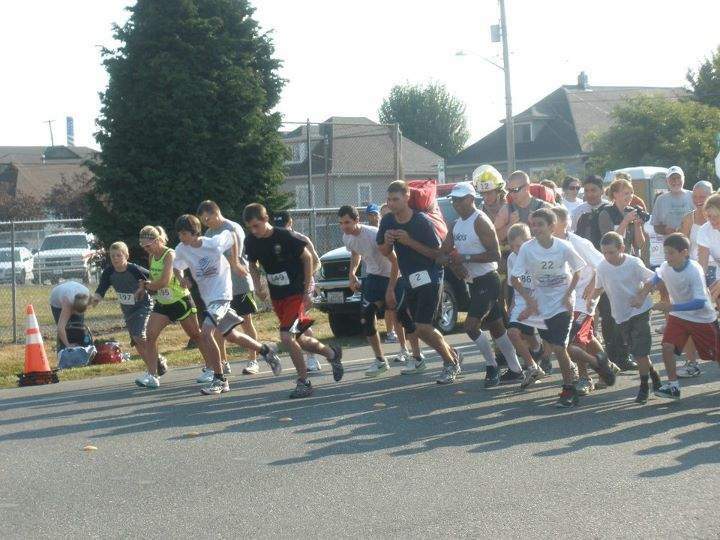 The start of the race, I positioned myself far right on the road (far left as your looking at the picture) and my son was next to me. I think he hung on for about 200 yards or so. 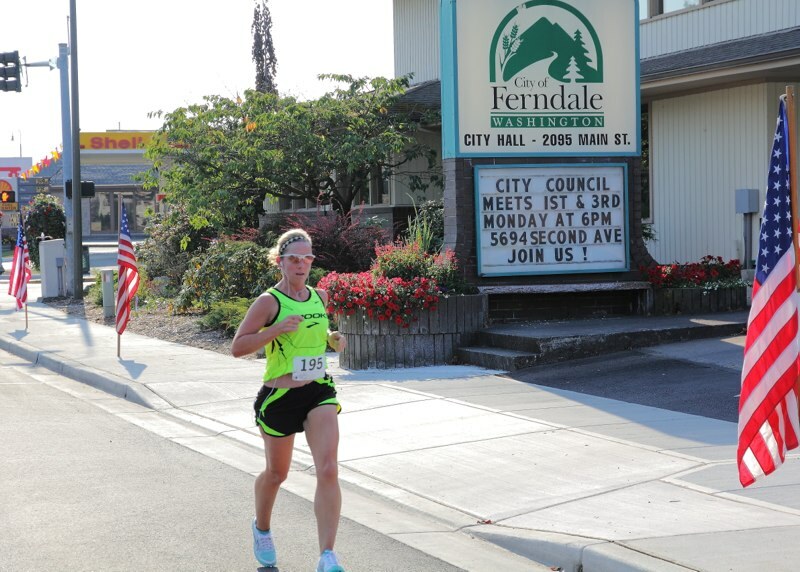 Slight uphill the first 1/2 mile up Main St.
Sprint to the finish and #105 passed me at the end. 4th overall. 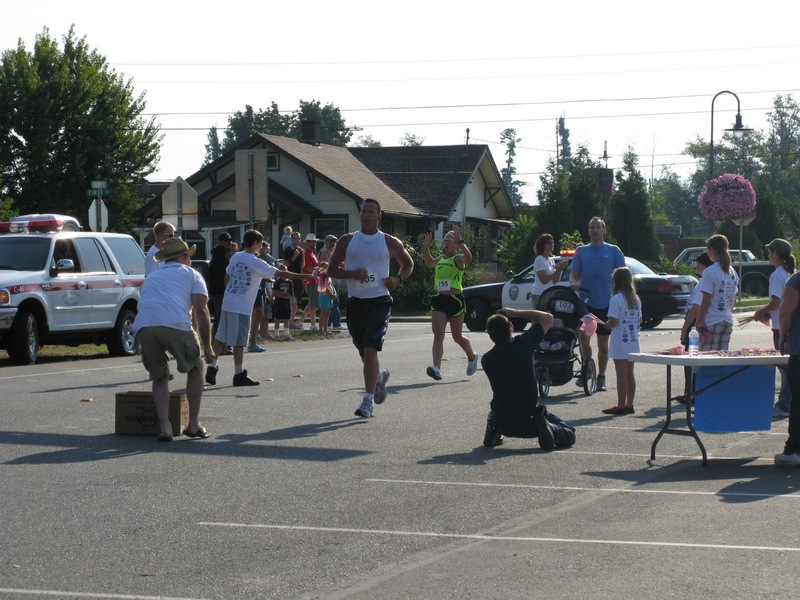 1st place Female! Armando was 2nd place overall. 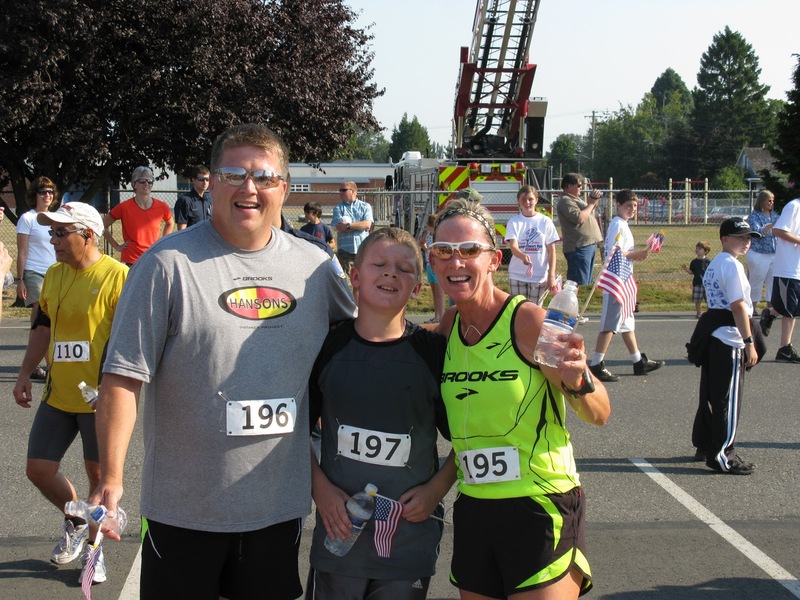 Spencer and Dean finish strong … Spencer was pooped! All in all, a great race! Although I would have really liked an official time for the books. I’ll take the win nonetheless and be thankful my legs remembered how to race. And hey, I won a pair of SuperFeet! I wanted every possible advantage for my triathlons (Oliver 70.3 and Ironman Canada) this season, so I considered investing in a TRI bike. 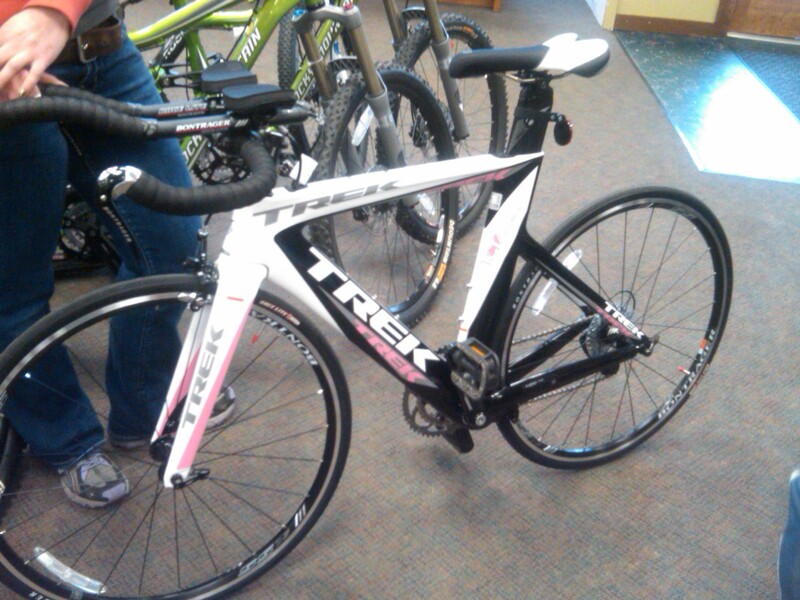 I already had an awesome road bike, a TREK Madone 4.5 WSD, and she (Maddie is her name) has never failed me. 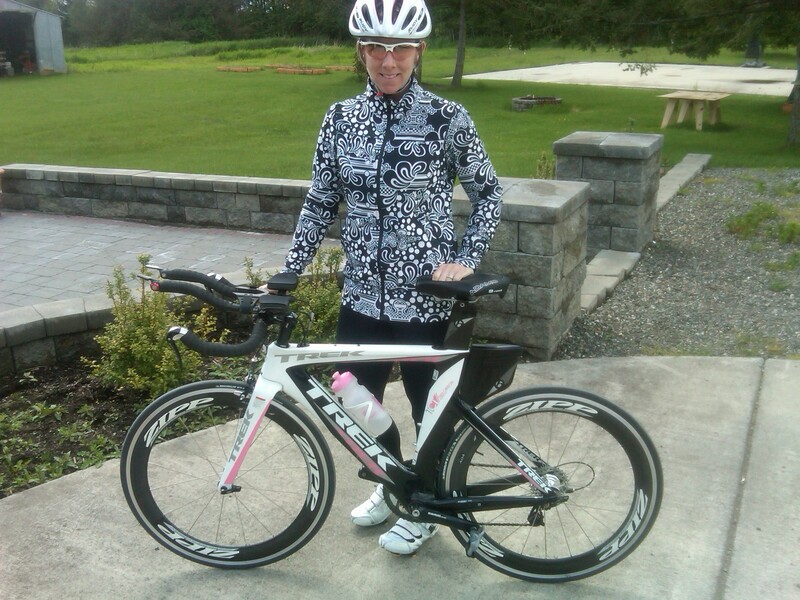 I put aero-bars on Maddie at the beginning of my Ironman Training and my coach fitted me to riding in this new position. He lowered the handlebar stem and adjusted my seat height and reach. I felt good to go! 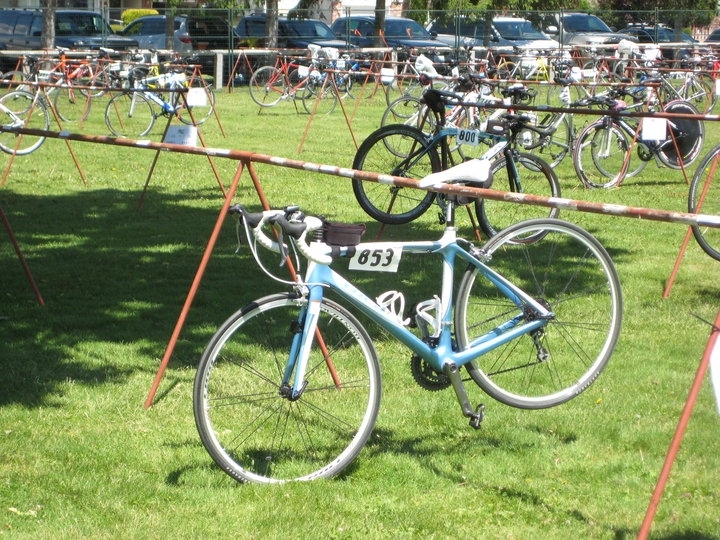 I completed several long rides, but by about March of this year, I was seriously contemplating a TRI bike. I went down to my local bike shop, Kulshan Cycles, and ordered it. This was a huge investment as I hadn’t even tried it out. Sight unseen, I ordered it from the owner, Moe, and told him I was sure this was THE ONE. Moe was also taking a gamble in ordering it because as a smaller local shop, if I didn’t want it, then he would hope to sell it to someone else. 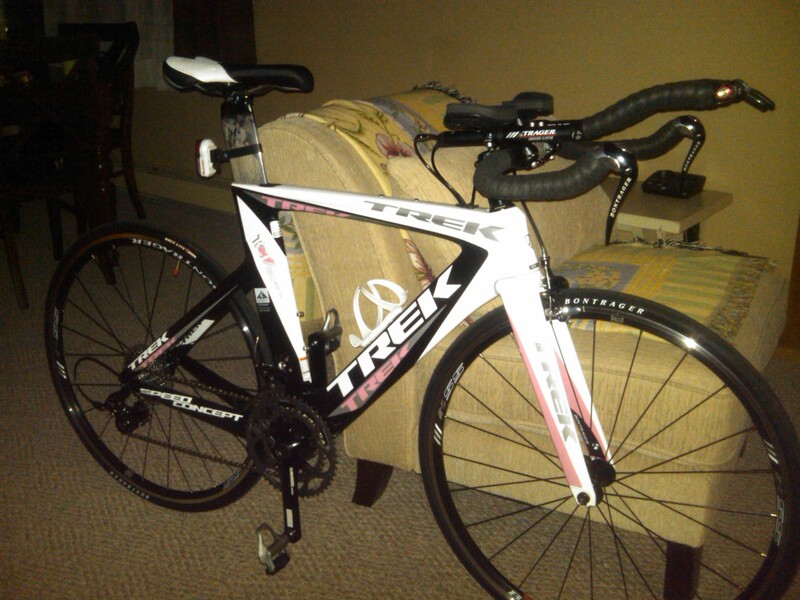 I thought, how could it not be as awesome as my Madone, afterall, it was a TREK and it was PINK! First things first, I bought some Shimano clipless pedals and had to remove the reflectors. It rode like a dream and shifted smoothly. It was equipped with SRAM Apex drive train, which was slightly different than the Ultegra drivetrain on my Madone, but nonetheless, easy to operate. I couldn’t let my dream bike home sit in the garage. I had to admire it some more … so, it hung out in the living room. After a couple hundred miles, it was time for a new saddle. The stock saddle (Bontrager Race Lite TT WSD) was very uncomfortable in the aero position and for long rides lasting more than 2+ hours. The girl parts were not happy with me. 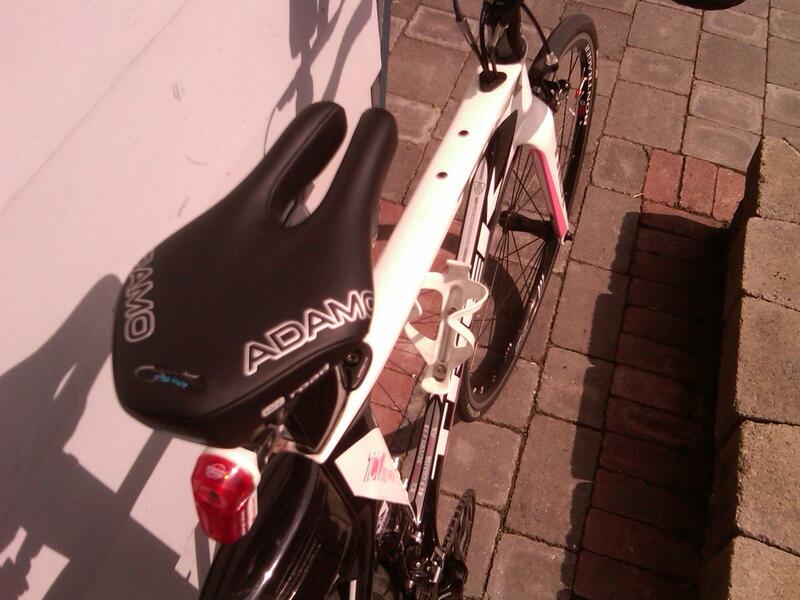 On my coach’s recommendation, I chose the ISM Adamo Road Saddle. I debated between the road and the race saddles, but after reading many reviews, I picked the road saddle. Quite simply, this is the best saddle EVER! My sit bones were sore after the first few rides because it is wider than a normal seat, but I quickly adjusted to it. The best part is that I have had no chaffing at all and it is comfortable for long rides in the aero position. One last thing I wanted for my supreme bike was … RACE WHEELS!!! So, I placed another order with Moe from Kulshan Cycles and on they went. REMARKABLE! They are Zipp Wheels 404 650c Clinchers. They are wicked FAST! What more can I say? 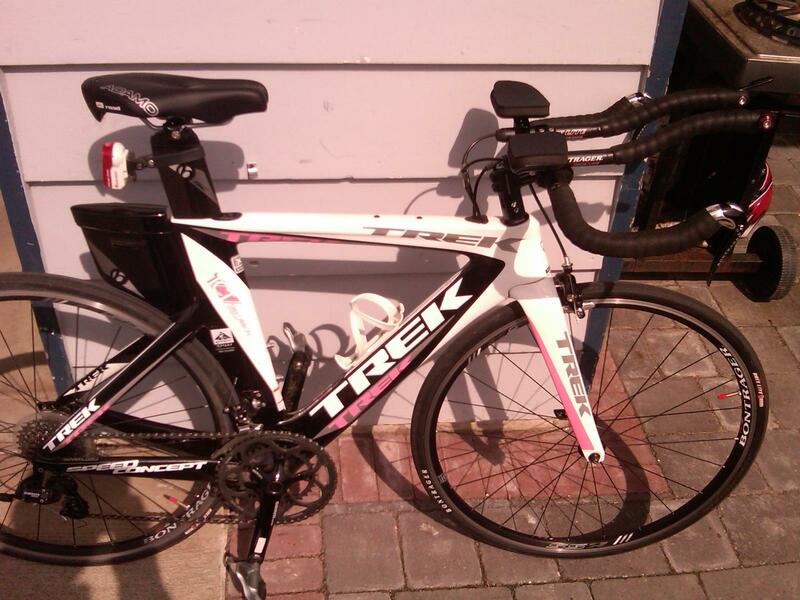 I love my TRI bike for racing, I also love my Trek Madone for road cycling! 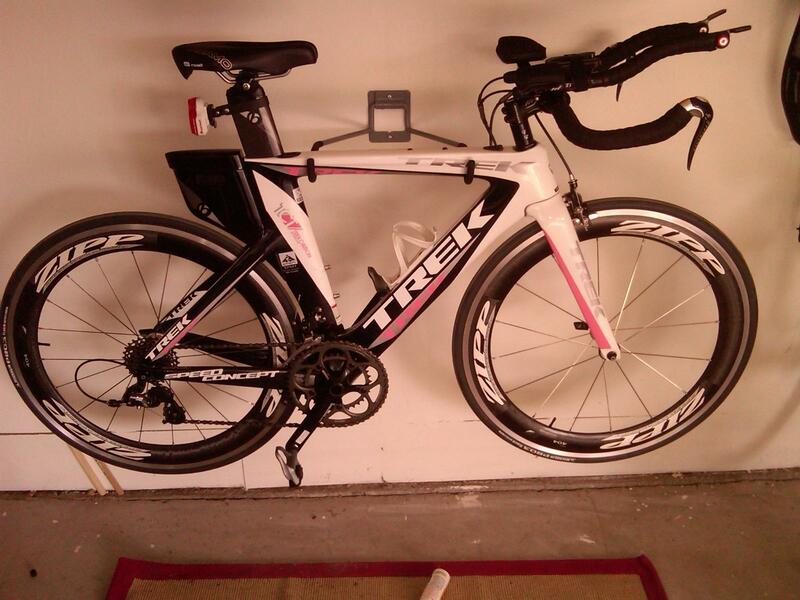 If you can afford it and want to race, a TRI bike is the way to go. You won’t regret it!